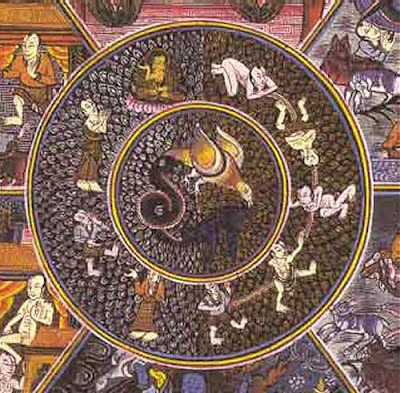 At the centre of Buddhist teaching is the concept of impermanence as embodied in the Wheel of Cyclic Existence seen above. Or, in everyday language, what goes around, comes around. Impermanence expressed through constant decay and change are also central to John Cage's music. Cage's long journey took him from championing the economic piano music of Erik Satie at Black Mountain College, North Carolina via his own sparse 1948 In A Landscape to the multi-layered compositions of his later years. 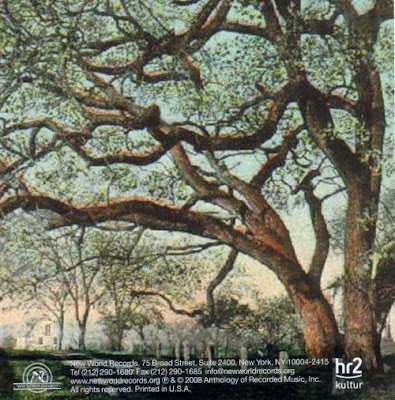 Now the musical wheel of existence has gone full circle and the new double CD, seen below, of music by a colleague of Cage has arrived to connect us back to the soundworld of Satie that started it all. Gordon Mumma was born in Framingham, Massachusetts in 1935. He studied piano and horn in Chicago and Detroit. From 1966 to 1974 he was, with John Cage and David Tudor, one of the three composer-musicians with the Merce Cunningham Dance Company, for which he composed four commissioned works. In 2000 he received the biennial John Cage Award from the Foundation for Contemporary Performance Arts. Mumma is best known for his pioneering contributions to electronic music using 'cybersonics' to modify the sound of acoustic instruments. These include Hornpipe (1967) for French horn and cybersonics and Pontpoint (1980) for bandoneon, bowed psaltery and cybersonics. This video from the 1987 Santa Cruz Saw Festival shows Mumma in full-on experimental mode. But stay with me, readers. There is another, little known, and very different side to Gordon Mumma. 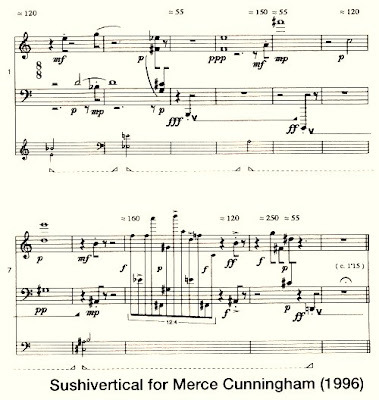 Over more than four decades he has produced a substantial body of music for the solo piano including Sushivertical for Merce Cunningham, the score of which is seen below. The solo piano music of Gordon Mumma is as far removed from his cybsersonic works as John Cage's 1948 In A Landscape is from his 1992 Seventy-Four, which is scored for that number of musicians including two pianos, two percussionists, harp and strings. Mumma's piano music uses the natural colours of the piano without intervention of electronics, screws or other objects. This is intimate and personal music that reflects the economic style of Satie. But the influences range far wider, from Bach and Haydn to Arnold Schoenberg, Anton Webern, Charles Ives, Ernst Krenek, Carl Ruggles, Ruth Crawford, and particularly Béla Bartók's spare Mikrokosmos. 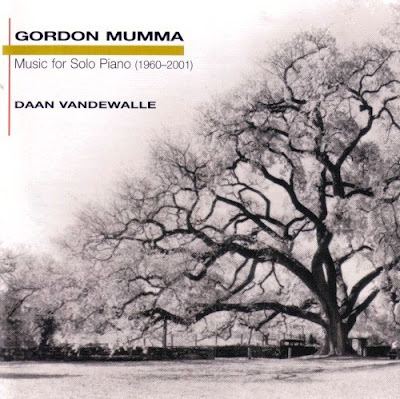 The new double CD from New World Records includes more than two hours of Gordon Mumma's music played by Belgian pianist Daan Vandewalle. 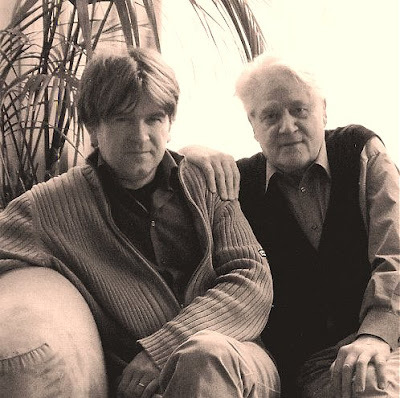 One of the works, Graftings, is dedicated to Daan, whi is seen in the photograph below with the composer. Daan Vandewalle is one of the new breed of European pianists who are doing very exciting things in the contemporary music field. He will be familiar to regular readers through his recording of Alvin Curran's Inner Cities which I webcast last year. You can hear a podcast of me talking to Daan via this link about Inner Cities. The Gordon Mumma album was a co-production with Hessischen Rundfunk hr2 Kultur and was recorded in the station's studios in Frankfurt, Germany. I hope that Gordon Mumma's reputation as a composer of progressive electronic music does not limit the market for this commendable release which is very much more than a spoke in the post-Cage wheel of musical existence. Yes, this is challenging late-twentieth century music, but it speaks in a language that is unusually familiar. But judge for yourself; New World Records have a selection of online samples, try Sushihorizontals for a starter. Now read about piano music from a contemporary icon.